YoRHa Betrayers is a Side Quest in NieR: Automata. 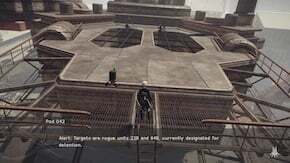 "The Commander has issued an emergency assignment: YoRHa units 8B, 22B and 64B have deserted and have begun terrorizing the Resistance Camp. 2B and 9S have been ordered to find and deal with them, no matter what. Pursue the runaway YoRHa androids. The camp leader is confused about the supposed rogue YoRHa units, as there haven't been any reports about recent raids. When attempting to notify the Commander of this, you find that access to the case has been restricted at the highest levels." Speak with Anemone in the Resistance Camp. This quest arrives into your Inbox after you reach the flooded portion of the City Ruins after the Goliath event. Go the locations marked around the City Ruins until you find two YoRHa units. Engage them in battle until they run away. Pursue to the next location. Continue searching the other marked locations around the City Ruins until you encounter them for the second time. After beating YoRHa units 22B and 64B, unit 8B should appear, defeat unit 8B to progress. You will have a call with Operator 210, completing the quest. After I found them under the bridge, I had to alternate between the rooftop flight suit location and on top of the goliath until they showed up on the goliath... just keep running between the three locations until eventually you find them. Can confirm, you don&apos;t need to do Forest Kingdom to find them. You have to find them in one of the spots randomly, then find them again in a second spot to fight them. For me, the first spot was under the bridge at the factory, and the second was on top of the fallen Goliath. For me the first spot was the galioth the second spot was the building you get the flight suit at. You have to go up those stairs, and over the stone bridge keep going until you see this little dip right behind that building. this kind of left a bitter taste in my mouth as I just finished this side quest. I found the on top of the goliath, but didn&apos;t find them in the building where you started, but the second fight was at the factory. Ive completed the game, and am trying to get all the weapons to face the lvl 99 emil boss (the second one), and i cant get this quest to show up at all, any help? i get the quest, i try to clear some sidequests. head for the closest one, up the goliath. very first spot i check and they pop up, then flee, per the norm. i do some other sidequests, check the starting area, comb through the entire building and check out the starting area. nothing. go to finally reclaim my body from the factory, they don&apos;t pop up when i go into the designated area either. nor do they pop back up on the return. do some more sidequests. finally, they show up at the starting area on the second run-through. as a note, they only spawned when i went to the right corner of the roof, the one on the building right in front of the ramp there. hopefully this helps? i&apos;ve only done this once so i realize things could use some verification, but it&apos;s something. "They will only appear in the second location after you complete the quest: The Forest Kingdom (I don&apos;t think this is true, I haven&apos;t done the quest and I found them.)" There are three spots marked on the map. After beating them at the first one (atop the Goliath) they escaped and then I couldn&apos;t find them at the supposed second spot (near where the flight units were) but I did find them at the third one (below the bridge) and I have not done The Forest Kingdom.